The other day during the Fangamer/Starmen.Net/EarthBound Central/Everything Else MOTHER 2 live stream event, Marcus Lindblom, one of the main brains behind EarthBound’s localization popped into the chat and really upped everyone’s excitement. He also answered a number of questions fans had and answered some mysteries as well! I wasn’t part of the chat, so I don’t know if more was discussed than just this. I think I heard that he popped in and out throughout the day. It sounds like he’s going to hang around the community more often, so if you see him around, tell him hi! It was incredible when Marcus started answering questions. To me, it felt like I finally got to meet a hero I’d always wanted to have some form of contact with. 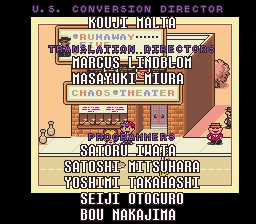 Localization is something I deal with a lot, and I’ve always been impressed by how natural Earthbound’s dialog always seemed to me. I suppose that could just be because of how much I played the game and how influential it was to me as a young kid, that perhaps I just became used to it. I don’t think that’s the case, though. 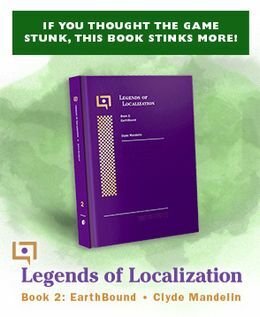 The game really felt like it was very well-prepared for the audience who would be receiving it in terms of how it was translated and localized. What’s more, he definitely acknowledged and showed appreciation for everything the community has been doing over the years, and that was very cool. Anyways, thanks for posting Mato! It’s fun to be able to see the connection we have started to have with people like Marcus and Itoi these days. I still don’t understand why they had to pronounce “Geeg” as “geegus” though! I always pronounced it Gee-guss (hard G, not J sound) when I was a kid. Although Giy doesn’t look like it would be pronounced like this, I think my logic was that if it were pronounced Gai-gus, it would have been spelled Guy or Gai. Who knows why they didn’t just spell it “Gigas”, or leave it as “Gyiyg” / “Giegue”. Because its cooler with a Y? No no no, it’s SPELLED “Giygas”, but it’s actually pronounced “Throat-wobbler Mangrove”. 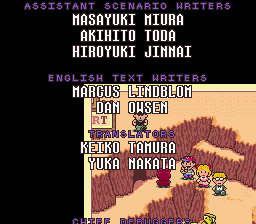 I thought Dan Owsen was responsible for the translation for EarthBound – am I losing my mind? Or am I just wolfing down Fly Honey? I second the emotion that it was like meeting a childhood hero but with one major distinction. The big difference is that normally heroes turn out to be much less than you’d envisioned them to be while Marcus was somehow so much more. Mato and Marcus in the same place, the two people who wrote such incredible text, it was such an incredible, memorable experience. I’d love to know more about what Nico thinks about it as she’s experiencing it. I’m sure many things about her either colored the text or will remind her of her dad growing up. We all connected with so much in that game, I can only imagine what it’s like for her to see so much of herself reflected in it. Marcus, I think I speak for all of us here that we really look forward to what more you share with us, and thank you for all you have already shared. It was an honor and a privilege to share time and an experience with you and I thoroughly enjoyed myself, even though I had to accept I’d been mispronouncing Giygas for almost 20 years! PS: “Super Ultra Mambo Tango Foxtrot Martial Arts” is NOT the lazy way out! I wouldn’t be able to remember it so clearly if it weren’t awesome! AdmiralCrunch and TragicManner… thank you so much for the kind words. Knowing how much work went into the translation, I can’t tell you how satisfying it is to have it noticed and especially loved for so many years. I absolutely have to give a huge thanks to Mato for being such a key part of keeping EB interest going for this long. Reid and the team at Starmen.net deserve a massive “thank you” as well. Obviously, the biggest thanks would need to go to Itoi-san for his fantastic game/story. I simply polished his brilliant dialogue and got to layer in a bit of goofy quirkiness, which thankfully many people responded to positively. So few games over the years have blended humor, emotion and gameplay the way Itoi-san did in EB, that I am grateful that I was given the opportunity to work on the game. Having fans like all of you that come here makes the effort worthwhile a million times over. So thank you so, so much as well. The work, while hard, was a lot of fun, and I realize (these days more than ever) how fortunate I was to work on EB. It was always my personal favorite project to have worked on. I will be around, talking more about my experiences working on EB, as well as stupid anecdotes from the game industry a bit as well, and hope that they are, in the end, at least a bit interesting. Oh, and Admiral… the primary reason I wasn’t really happy with the “Super Ultra Mambo” line was that it was my quick, first look at the line, and I intended to go back and think of something better, but never got the chance. So it’s not so much that I hate the line, but I somehow remember that it was one I really wanted to fix, but didn’t… But I’m glad people liked it in any case! Save up your questions… there will be more chances to ask me later! So, now that we know the official pronunciation of “Giygas”…how’s “Onett” supposed to be pronounced? I’ve heard it sooo many different ways, it’d be nice to know what it’s “supposed” to be.